One of my boys was out fishing last year and told me about some foundations that he noticed on a hillside, on the way to one of his favorite fishing holes. I just got into metal detecting a few years earlier and I had asked him if he knew of any good spots where I could coin fish, while he catches some real fish. The pictures will tell most of the story but what I learned when taking one of my experienced metal detecting friends there was priceless. I saw how the homes were built and how large ice blocks would be used to keep their food items cool. 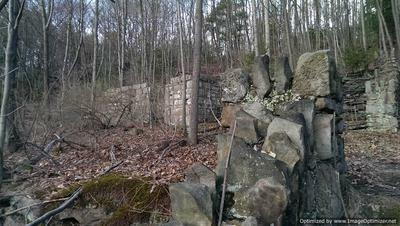 How a fruit tree and an isolated pine tree could give away the location of an old foundation. These foundations hugged the railroad tracks mostly, I did not find all of them and I was only at this spot for a few hours before my friend got tired and we had to head out. 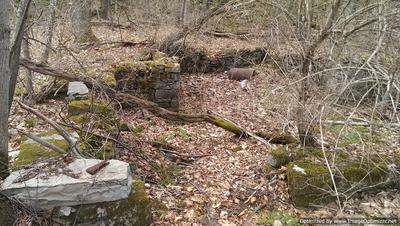 It is a 2 mile hike along those railroad tracks to get to these foundations. It was well into spring but you can see the ice still clinging to the hillside, the dark blue ice that settlers would have tossed into their basements in what would be their cooler. 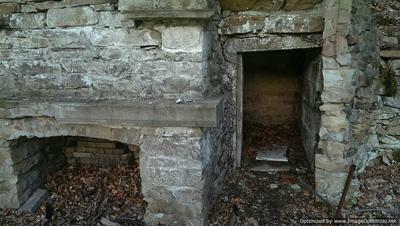 I did not find anything besides the old foundations so take a look at my first ghost town adventure. Some of the foundations are older than others, not sure when these were built but if I had to guess, I would say late 19th century. WOW! Great pics and story! 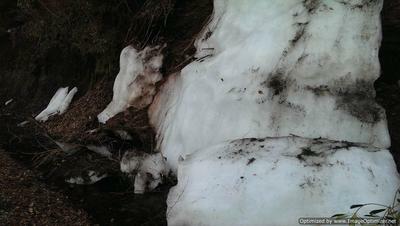 What you saw is not uncommon in some areas in the east. Other areas do not have as much structure left as what you saw. Still interesting to find though. It was a tough way to live. They were always working in the most extreme conditions. Hot, humid summers, with no bug spray. lol. And cold, nasty winters.